Relocating to Eastern North Carolina? Our New Home Staging to Live concept is a little different from Staging to Sell. When you stage a home to sell, you are taking the “personal” aspects out of the home to appeal to more potential buyers. Staging to Live is quite the opposite. When we stage a house for someone to live in we are taking the clients personal tastes and style of living into consideration. Through balance, color and creativity we can create a warm and inviting space that reflects who you are. We use the things you already own and love. This is a perfect solution to new homeowners who need a bit of help making everything “work” in their new space. We can also make suggestions to make your home really shine such as new paint colors or accessories to purchase in the future. This is the perfect solution for new homeowners or military families relocating to Camp Lejeune or New River Air Station in Jacksonville or Cherry Point in Havelock. This process begins with an initial visit where we will tour the home, discuss what room(s) need to be staged, get acquainted and come up with a design plan. There is a flat fee for an initial consultation and hands on staging fees are based on an hourly rate. We can stage just one room or the whole house…it’s up to you! Have you grown tired of the look of your home? Does it seem drab, lack luster and in need of a face lift? Why not hire Lisa and her team to can give it an updated look that reflects your personality and style of living. Interior Redesign is a budget friendly way to freshen up a space because we reuse, repurpose and rearrange items you already own. You may start with an initial consultation where we will get to know each other and tour the room(s) in need of a makeover. We will discuss what you like about the room, what you don’t, and how you and your family use the space. If you decide that you would like to move further and hire Lisa’s for the job we will then set up and appointment for the room redesign. I will assess the room, examine traffic flow needs, and figure out what “works” in the room and what doesn’t. 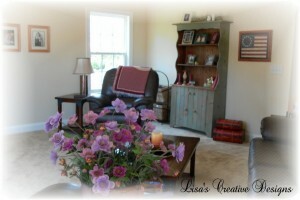 I will creatively redesign the space by editing, rearranging, repurposing. We will go “shopping” in other rooms of the home (with your permission of course) for furniture and accessories to add to the room giving it a fresh new look. Perhaps you want to kick it up a notch and change the color of the room too! Simple changes like new paint can add impact to a room for a little bit of money. Repainting or adding new fabric to outdated furniture can be a quick and inexpensive way to give it a fresh new look. A typical room redesign can be done in a few hours to a day unless there is extensive painting or furniture redesigns to be completed. Our staging and decorating service area include Swansboro, Emerald Isle, Jacksonville, New Bern, Wilmington, The Crystal Coast of NC and Surrounding Areas. 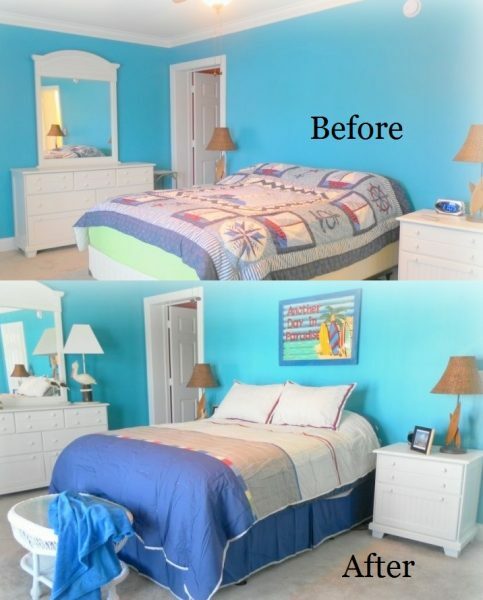 Please take a few minutes to check out a few before and after photos here.